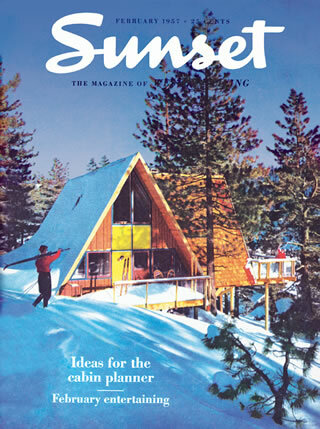 When David Perlman's A-frame cabin hit the cover of Sunset magazine in February 1957, this celebrated photograph by Eichler photographer Ernie Braun ushered in the A-frame's ascent into California trendiness. Inside George Rockrise's Perlman cabin, Squaw Valley, 1956. There couldn’t be a more playful setting in the ‘50s and ‘60s than Squaw Valley. With Interstate 80 newly linking the valley to San Francisco via a four-hour drive, Tahoe became a weekend destination. There, before the Olympics, a small group of pioneering early skiers started buying up parcels of land at incredibly low prices. These were not investors, but rather leisure-time adventurers who wanted their weekend homes to reflect their carefree spirit. “Everybody knew each other,” recalls Bay Area architect Henrik Bull, who designed many early California ski cabins. “Your circle of friends probably stayed within 20 or so homeowners,” who would have each other over for après-ski parties, watch each other’s kids, and socialize together in their leisure time. The concept of the triangle-shaped house stretches through history, from Swedish woodsheds to Polynesian huts. But on the West Coast, Randl traces the form as we know it today to the Bay Area, where industrial engineer Wally Reemelin built several A-frames as student housing in the Berkeley Hills in 1948. In 1950, San Francisco architect John Campbell sketched out a design for what he called the Leisure house, an A-frame kit he submitted to Interiors magazine. The magazine published the unbuilt structure, and the Leisure house catapulted to popularity as the “most publicized A-frame of the decade,” Randl writes. 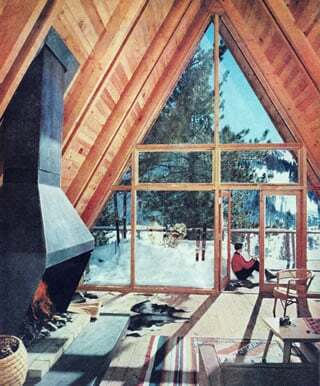 But custom, architect-designed A-frame ski cabins arguably started with one stray doodle in 1953. That’s when Bull, then in his last year of study under Buckminster Fuller at MIT, sketched a triangular-shaped cabin that his friend John Flender unexpectedly suggested they should build. 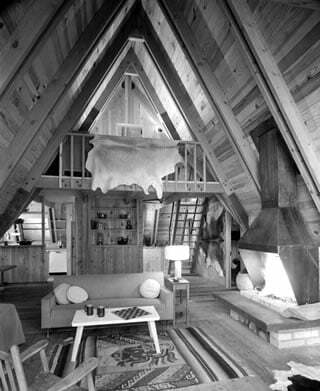 So that summer, in Stowe, Vermont, the pair built what, according to Randl, was arguably the first architect-designed A-frame ski cabin in the country. Bull moved to San Francisco in 1954, and went to work briefly for architect Mario Corbett. But he would soon branch out on his own, starting with Tahoe-area ski cabins before going on to build resorts such as Tahoe Tavern and Northstar ski resort, and a host of other California buildings in the Bay Region School. In 1967, Bull co-founded the firm Bull Field Volkmann Stockwell, which is still operating today. Bull’s first private commission was a ski cabin in Squaw Valley he designed for Peter Klaussen, who was working at Squaw at the time. Not quite an A-frame, the home had a roof whose peak ran diagonally to its square foundation, giving it a dramatic intersection of glass walls in one corner.